PBS Election Central is a collection of educational resources related to the 2016 U.S. Presidential election. The collection includes interactive maps, virtual field trips, and videos. Within the PBS Election Central collection there are resources appropriate for elementary school, middle school, and high students. 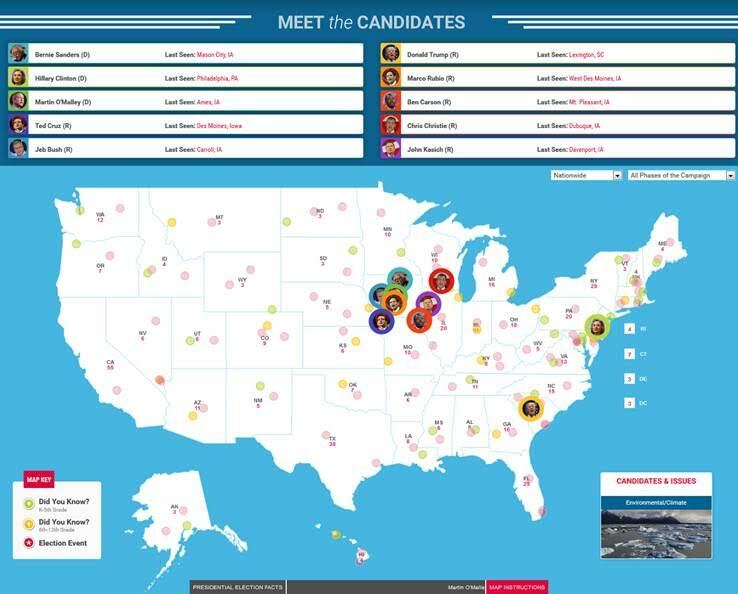 The central feature of PBS Election Central is an interactive map of candidates on the campaign trail. The map displays important and interesting facts about each state and each candidate. The map will show students where a candidate was most recently seen campaigning. Students can also use the map to find quotes from candidates about hot-button campaign topics like immigration, defense spending, and climate change. The interactive PBS Election Central map is appropriate for middle school and high school students. For elementary school students you will want to explore PBS Kids: The Democracy Project. There you will find resources to help students understand how voting is conducting and why voting is important.